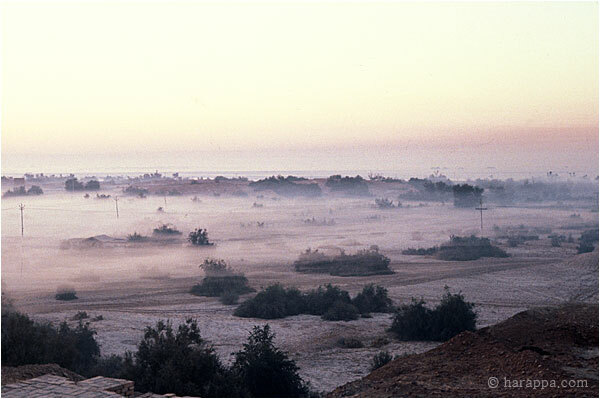 On an early winter morning the mist settles in the low-lying areas of Mohenjo daro between the "citadel" and the "lower town". In the distance the heavy mist on the Indus River forms a solid white line. The mounds of the "lower town" are barely visible above the mist and in the foreground are the edges of brick structures belonging to the Buddhist monastery complex on the "citadel" mound. All images appear Courtesy HARP and the Dept. of Archaeology and Museums, Government of Pakistan.